When you think of harnessing solar power, you probably think of photo-voltaic (PV) solar electric panels. We'll discuss PV systems in detail below, but they're one of the least efficient ways to harness solar power. Using solar power to directly heat the water or air in your home can be a far more cost-effective approach, and can be used side-by-side with PV panels to get the best bang for your solar power buck. Harnessing the energy of the Sun is a great solution for small spaces, both on- and off-grid. Since the energy requirements for small spaces are much lower than typical construction, investing in solar powered tech can provide for a large percentage of your energy needs. About 18% of home energy is used to heat water, and it's far more efficient to heat water directly with the sun than to drive an electric water heater with a PV panel. Package systems are available with a roof-mounted storage tank and backup electric heating element. Incorporating the tank into the panel simplifies installation and saves space, but you live where sub-freezing temperatures are common, it's best to keep the water storage tank inside the heated envelope of the house. Split solar water heating systems generally use a glycol (antifreeze) loop to collect heat from a roof mounted panel, and bring it to an insulated water tank with a built-in heat exchanger. The system needs a small pump to circulate the water, since natural convection would keep the hottest water on the roof. There are two types of solar water heating panels. Flat plate panels are cheapest, and work well in warm climates with lots of sun, since the water is exposed more directly to the temperatures on the roof. Evacuated tube panels work better in colder climates with less sun. The air is removed from an enclosed space between the outside of the tube and the pipe holding the glycol solution, like a thermos with a transparent outer shell. This design allows solar energy to pass through, but doesn't allow heat to escape into the cold air. If you're considering using any roof-mounted solar in your home, it would be worth reading up on solar water heating system options and construction. A solar water heating system is a no-brainer on any tiny house where PV solar panels might also be practical. A passive solar heating panel is essentially a small, flat greenhouse, typically mounted vertically on an exterior wall, with black air ducting to collect solar heat. The panel faces South (if you live in the Northern hemisphere), so the Sun hits it most directly during the Winter, when the Sun is lower in the sky. Natural convection can drive air through the panel and into your living space, or a fan can be used to help circulate the air. Roof mounting is also possible, but it requires a bit more extensive ductwork and fans, and would compete for space with water heating and PV panels. Wall-mounting usually provides the best angle for the Winter sun. 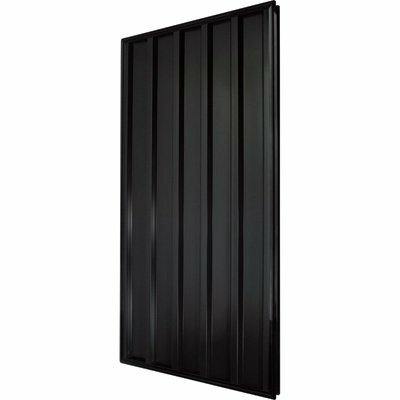 Flush mounting against the house or integrating into the wall prevent heat loss through air circulating behind the panel. 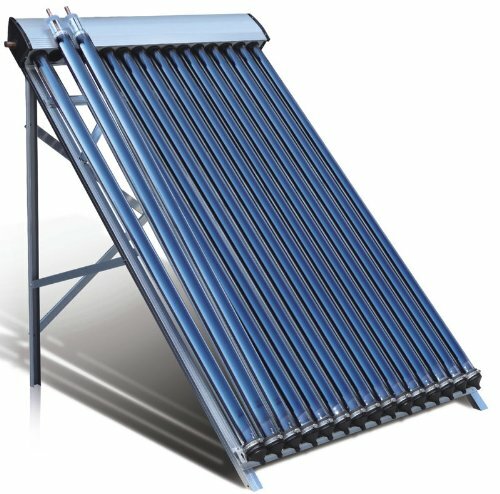 Commercial solar air heating collectors are available for purchase, but they tend to be impractically expensive for the amount of heat they produce. A far more cost-effective option would be to custom-build your own custom solar heating collector into the exterior wall of your house. Check out this helpful guide on building DIY passive solar heating panels. To get the most out of passive solar heat, you'll want to make sure your space is very well insulated and airtight to prevent your heat from escaping. The downside of airtight construction is that it tends to cause indoor air quality to deteriorate. The buildup of humidity, VOCs, dust, and mold spores can be unhealthy. Using a heat recovery ventilator (HRV) in this type of space is a good idea, since it exchanges fresh air from outside while recovering the heat from the exhausted air during the Winter, and keeping the heat outdoors during the Summer. A photovoltaic (PV) solar panel is made up of an array of individual cells that convert solar energy directy into electricity. Polycrystaline panels are cheaper, but tend to be larger for the same voltage output. Monocrystaline panels are more expensive, but are smaller, and perform a little better in cloudy conditions. For most tiny houses, the cheaper polycrystaline panels are likely to be the better buy, since you'll have enough roof real estate to use the bigger panels. Small or medium sized RVs, buses, or vans might benefit from using monocrystaline panels so that more can be packed onto the small roof area. Flexible panels are also available, but they're generally more expensive than rigid panels, seem to have longevity problems, and the only real advantage is aesthetic. Since they attach directly to the roof material, they heat roof rather than shade it like a framed solar panel would, they don't allow airflow behind the panel to keep the cells cool, and they can be tough to remove for a warranty claim. Avoid flexible solar panels unless you have serious aesthetic concerns. Off-grid structures frequently use 12 volt solar systems, since there are so many options for appliances that can run directly off 12 volt power. Using 12 volt power instead of a higher voltage means you either need to use thicker (more expensive) wires, or lose some of your power on longer wire runs. 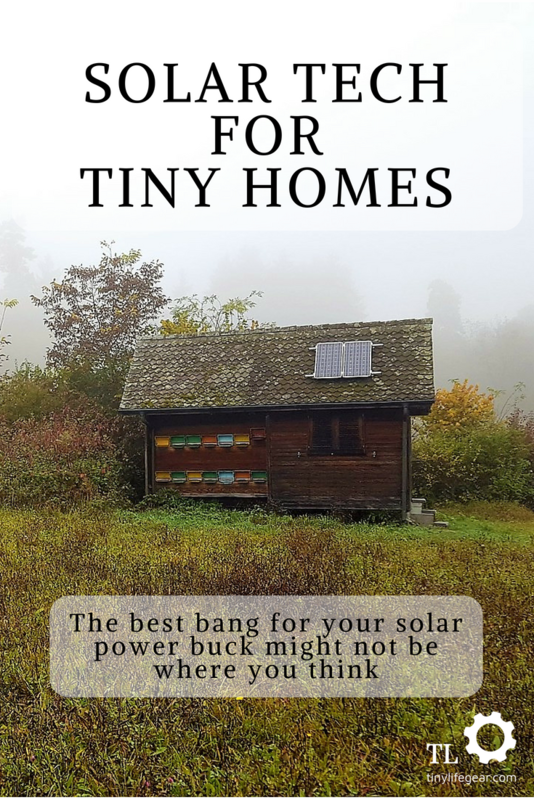 But since tiny houses can be built with fairly short wire runs, a little planning can make 12 volt power a very practical option. For structures that are solely use 120 volt AC power, especially ones that were not originally set up for solar and need long wire runs, a 36 or 48 volt system might be more attractive. If you're not using your DC power directly, there's no advantage to using the more expensive fat wires needed for a 12 volt system. Tilting panel mounts can help increase the efficiency of your panels during the Winter. If your house is stationary, tilting your panels seasonally can help soak up as much sun as possible during the Winter months. However, if you're nomadic in an RV, bus, or a van, the expense of purchasing tilt mounts plus the headache of constantly tilting and stowing them is probably not worth the bit of extra power you'll get. Better to mount your panels flat to your roof and leave them there. If you have a curved roof like a skoolie or an Airstream, AM Solar's rocker foot mounts are perfect for mounting panels to a curved surface. If you're not sure how many panels you'll need, or if your needs might change in the future, consider making your solar system as easily expandable as possible. Use a roof combiner box and the fattest wire you could possibly need to go from the box to your charge controller. That way, you can buy a few panels to start, and add more as needed. For a small structure or an RV, AM Solar's RV roof combiner box is a great choice. For a tiny house with more roof space, a household PV combiner box might be better. If you have limited roof space, consider adding a outside solar inlet at ground level to hook up a ground deploy. These are relatively low cost additions to make while your walls are open, and make it far easier to expand the system to fit your needs in the future. If you want your solar to work off-grid, you'll need a battery bank to store your power. You can adjust the voltage of your battery bank if you're using multiple batteries depending on how you wire each battery together. Wiring in series will add the voltages together, while wiring in parallel will keep the voltage the same, and add the capacity. Two 12 volt 100 amp-hour (AH) batteries in series will produce a 24 volt battery bank with 100 AH of capacity. On the other hand, the same two 12 volt 100 AH batteries in series will produce a 12 volt battery bank with 200 AH of capacity. Series wiring can be combined with parallel wiring to produce the desired battery bank voltage and capacity. For instance, four 12 volt 100 AH batteries could be wired in two parallel banks of two batteries, each set of which is wired in series. This series-parallel configuration would yield a 24 volt 200 AH battery bank. Let's power that air conditioner with a 12 volt battery bank. 1,200 watts drawn from a 12 volt battery bank is 100 amps. So, that air conditioner running for an hour off a 12 volt battery bank (assuming no inverter losses) would consume 100 amp-hours of capacity. If our inverter is only giving us 85% efficiency, that number would be closer to 118 AH in the real world. For energy storage, you will need deep cycle batteries. Deep cycle batteries are meant to be drawn down relatively low and recharged repeatedly without damage, while starting batteries are meant to stay relatively fully charged for their entire life. Car batteries are not appropriate for storing solar energy for household use. We'll be looking for deep cycle batteries designed for marine use, electric golf carts, or other deep cycle energy storage batteries, which are rated by Amp-Hours (AH) of capacity, not cranking amps (CA, MCA, or CCA). Wet cell lead acid batteries (also called flooded cell batteries) have the lowest up-front cost, but have high maintenance needs and a relatively short lifespan. Lead acid batteries are heavy, and since lead acid batteries can off-gas, they need to be vented to the outside. To avoid damage to the battery, lead acid batteries should only be drawn down to around 50% of their capacity before being recharged. Wet cells need to be checked periodically and topped off with deionized water when the electrolyte level gets low. Batteries are classified by "group" numbers, referring to standard case sizes. 12 volt Group 27 batteries are a popular case size, about the size of a car battery, with around 115 AH of capacity. Larger batteries are available for more capacity, like this 6 volt Group L16 battery with 435 AH of capacity, two of which could make a 12 volt 435 AH battery bank. Absorbent Glass Mat (AGM) batteries are also lead acid batteries, but they're constructed in a way that makes them spill-proof, less likely to off-gas, and never need their electrolyte topped off. Unlike wet cell batteries, AGMs can usually be installed in the living space, and depending on the manufacturer, may be mounted sideways. Similar to wet cell batteries, they can only be safely drawn down to around 50% of their capacity to avoid damage. AGM batteries are more expensive than wet cell batteries, but their low maintenance and longer life can make up for the initial investment. This Lifeline 12 volt Group 27 AGM battery has 100 AH of capacity. This 6-pack of 6V 200 AH AGM golf cart batteries could be used to make a 12V 600 AH battery bank. Gel cell batteries are similar to AGMs in that they have a mostly sealed design and don't need to be kept upright. Gel batteries are somewhat less tolerant to heat, and are charged at a lower rate than AGMs, but they're inexpensive and can work well for PV solar systems. Lithium batteries (specifically LiFePO4 chemistry) are relatively new technology, and expensive, but they have lots of advantages. Lithium batteries are about a third of the weight and half the size of lead acid batteries for the same capacity. They can be safely drawn down to around 20% remaining capacity, and since they last around six times as many cycles as lead acid batteries, their lifetime cost per cycle is competitive with lead acid batteries. A lithium battery bank needs more thorough battery monitoring than lead acid batteries, which adds to the initial investment. Companies like AM Solar offer lithium battery banks complete with external hardware, while companies like Battleborn and Lifeblue offer package lithium batteries with the BMS equipment built into the battery case. You can also find DIY instructions for making your own battery bank out of relatively cheap 18560 lithium battery cells, but beware, not all lithium batteries are created equal. Even with a battery management system, battery chemistries other than LiFePO4 can be unstable, and have been known to violently catch fire. For a large battery bank that you're going to be charging and discharging inside your home, it's probably best to purchase a commercially available battery package unless you really know what you're doing. In order to manage your stored electricity and avoid damaging your battery, you need a reliable battery monitor. Simple voltage readings are not a good indication of a battery's overall state of charge. In order to calculate the battery's true state of charge, you need to use a shunt that monitors the amount of current flowing through it in either direction. Some inverters or solar controllers will have an optional battery monitor kit available. For instance, Magnum Energy offers the ME-BMK battery monitor kit that integrates with their inverter's remote display. Standalone battery monitor kits like the TriMetric TM-2030 battery monitor (need to purchase the shunt separately) and Victron's BMV-702 battery monitor (includes the shunt and, optionally, a temperature sensor) are also good choices. Wire gauge in DC electrical systems is a critical factor in your design, and there's no one-size-fits-all wire. High current traveling through long runs of thin wire encounters electrical resistance, which creates heat. Too much heat, and you'll start an electrical fire. You can always use thicker wire, but thicker wires are more expensive and harder to work with. Consult a voltage table to assist in choosing the proper wire size for your project. Remember that each wire need to be protected by a fuse or circuit breaker designed to limit the current flow to a number that the wire can handle. Fuses and breakers protect wires, not appliances. You'll likely use different wire sizes for different applications. Depending on the size of your inverter, you might use a 2/0 AWG wire for a very short run from the battery to the inverter with a 200 amp fuse. For 15 foot runs of wire to your DC receptacles, you might use 14 AWG wire and a 10 A fuse. To minimize line losses from your solar panels, you might use 12 AWG from the panels to the combiner box, then 4 AWG from the box to your charge controller. For high-current runs requiring wires thicker than 4/0 AWG, multiple parallel runs of 4/0 wire can be used. For use in a structure that moves regularly like an RV, van, or a boat, marine grade stranded wire is the best choice for both your AC and your DC systems, since it's least likely to be damaged by repeated bending and vibrations. If your home is mostly stationary, you should be fine with using Romex for your AC system, and stranded wire for your DC system. For large DC wire sizes, welding cable can be a good choice. A charge controller is required to collect to mediate the power flow from your panels to your batteries. Charge controllers improve charge efficiency, prevent batteries from over-charging, and stop current from flowing backward from your batteries to your panels overnight. Most newer charge controllers are MPPT (maximum power point tracking) versions, which can pull a little more power from the same panels than older PWM (pulse width modulation) controllers. MPPT controllers also have the ability to use solar arrays and battery banks with mismatched voltages, so a more efficient 24 volt panel array could be used with an MPPT controller to charge a 12 volt battery. Solar charge controllers need to be matched to the number and voltage of the panels, since too much current could damage the electronics. For instance, this Victron MPPT 75/15 charge controller can handle up to 220 watts of solar at 12 volts, or 440 watts at 24 volts. If you have a larger array, you might need something like this Victron MPPT 100/30 charge controller, which can handle up to 440 watts at 12 volts, or 880 watts at 24 volts. For very large arrays, multiple charge controllers might be used. Ideally, multiple charge controllers should be able to talk to one another for the best efficiency and to keep your batteries as healthy as possible. Other helpful features to look for on solar charge controllers, are remote display capabilities and adjustable charging profiles. 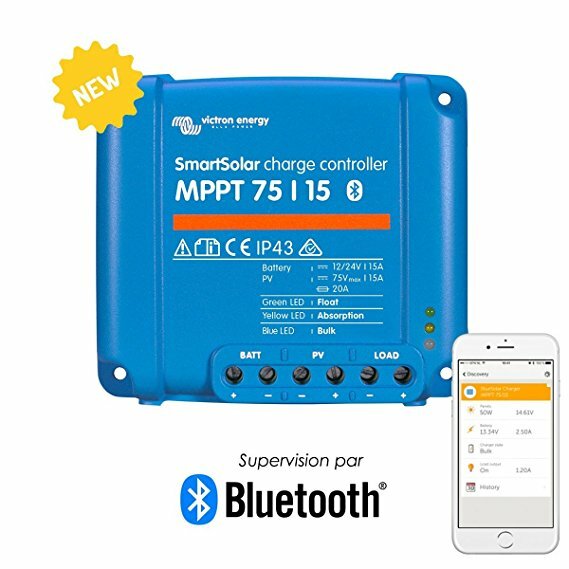 The Victron MPPT charge controller can connect to your phone via bluetooth for remote monitoring and configuration. Most charge controllers are configured from the factory to charge lead acid batteries, but if you use a lithium battery bank, it's critical that you're able to change the charge profile to match your battery bank. If you want to run your household 120 volt appliances using solar power, you're going to need an inverter. There are a few types of inverters (pure sine wave, modified sine wave, and square wave), but for household use, it's usually best to stick with a pure sine inverter, which will ensure that all of your appliances will work, regardless of how sensitive their components are. Special grid tied inverters are required to match the voltage and phase of the grid if you're planning on selling power back to the utility. It's worth noting that grid-tied solar installations generally can't be used to generate power when the grid is down. If you're looking to generate power locally when the grid is down, you're going to need a some additional equipment. Smaller inverters waste less power than large ones, so you'll want to size your inverter as closely to your needs as possible. Add up the wattage of all the appliances you're likely to run simultaneously on solar power, and make sure your inverter can supply that number. If you only need to run a few small appliances like a laptop or a television, a small 350 watt inverter may be all that you need. For most tiny homes or RVs with 30 amp service, a 2,000 watt inverter will normally be sufficient to power your appliances, with the possible exception of a large air conditioner. If you want to run your AC with a 2,000 watt inverter, depending on its size, a soft-starter might help. 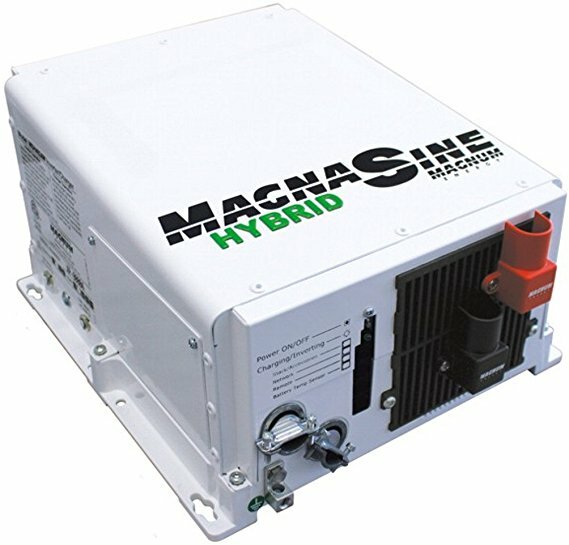 Hybrid inverters can be helpful for powering appliances with high current draws using shore or generator power that isn't sufficient to keep up with the load. 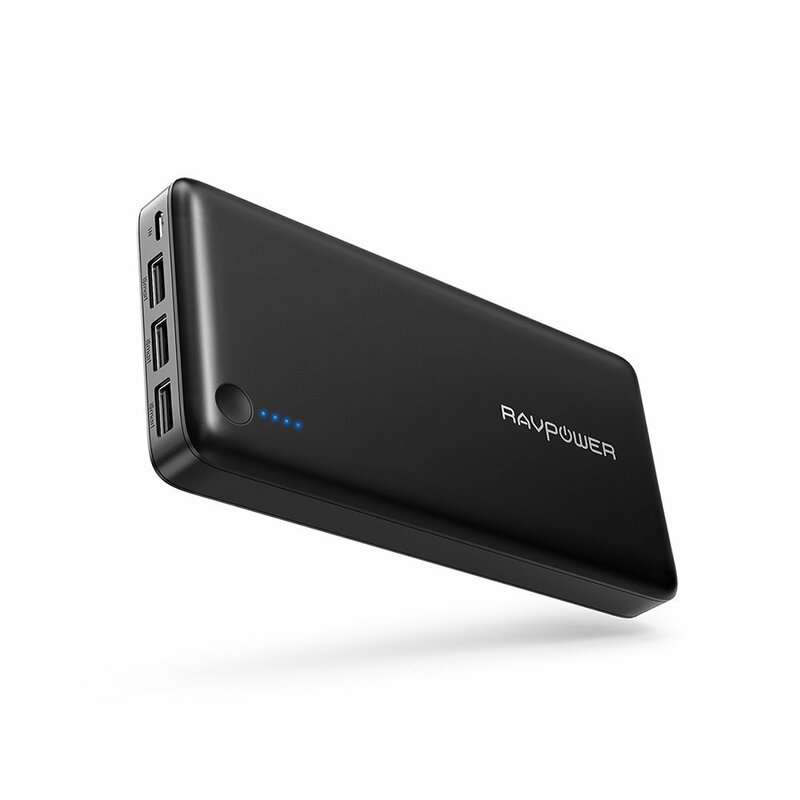 The hybrid inverter limits the power draw from the shore power to a set point, and pulls the rest of the power needed from the battery bank. This technology can be helpful for 50 amp RVs or tiny houses running air conditioners, hooked up to 15 or 20 amp household service or a small generator. However, a more cost-effective and efficient solution might be to install a soft-starter on the air conditioner and use a smaller inverter. If you're looking to set up a small solar system on a tight budget, it's worth taking a look at the package PV solar kits available. 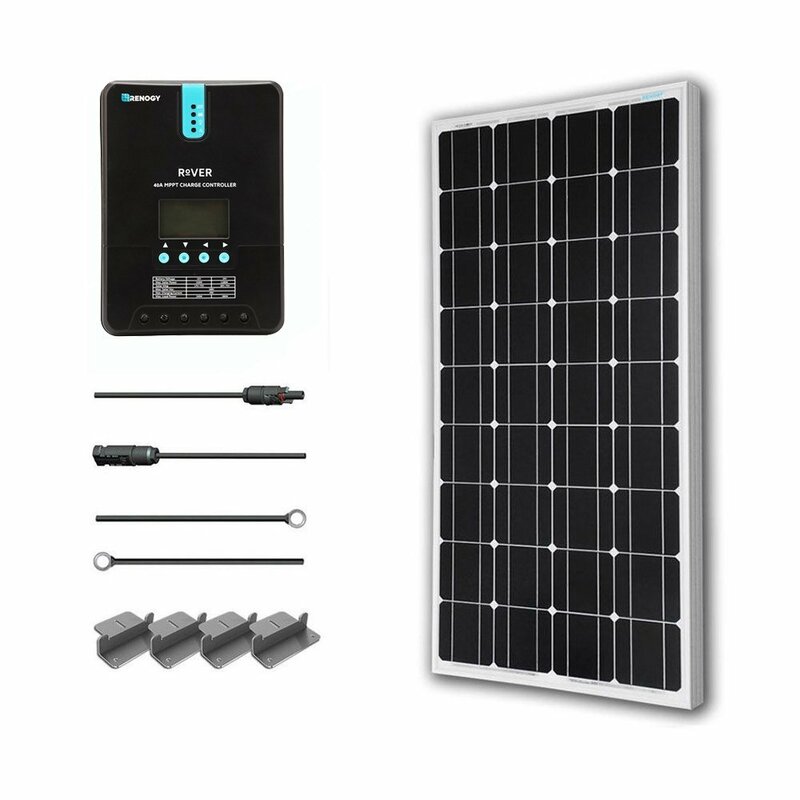 These kits typically include one to four 100 watt panels, some wiring or mounting accessories and a solar charge controller. Most of the lower end packages come with a PWM charge controller, which might be just fine for your needs. If you want a MPPT controller, there are premium kits available that include it. Be sure to check the specs on the controller to make sure it will handle any expansion you plan in the near future. If you might add more panels or use lithium batteries, it's a good idea to buy a charge controller that can handle it so you don't have to buy the same piece of equipment twice. Local, state, and federal tax incentives are sometimes available for adding solar systems to your home. Non-electric solar systems like water heaters are often included, as are batteries, inverters, wiring, labor, and other PV system costs in addition to the panels themselves. Even if your home is a van or RV, you might be eligible for the tax incentive, so it's worth checking into if you're considering adding a solar system. 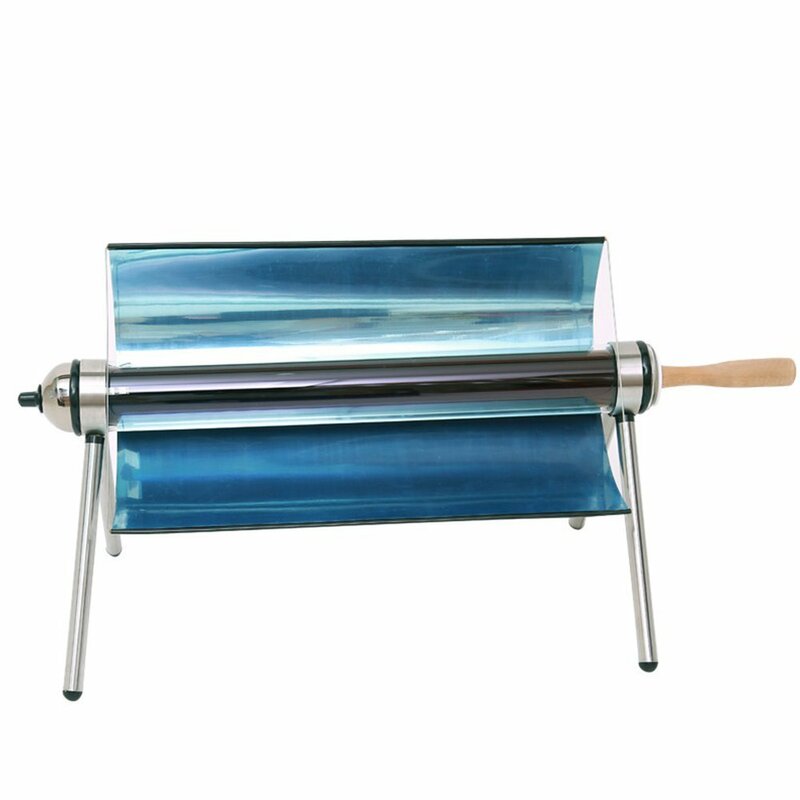 By reflecting and concentrating the sun's rays on a cooking vessel, a solar oven can achieve hot enough temperatures to cook a meal, or even boil water, with no fuel other than sunlight. 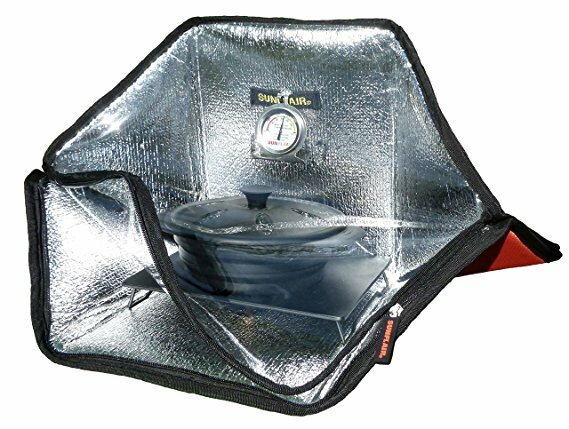 Solar ovens are available with soft sides that pack small for backpacking, rigid sides for higher temperatures and faster cooking, and evacuated tubes for super high efficiency. While they can be fun for camping, and useful for emergencies, solar ovens aren't likely to work as your primary cooking appliance. Like any cooking appliance, you'll need to balance the expense and storage space the oven consumes with how often you're likely to use it. For most people, since a solar oven can be difficult to control and only works when the sun is shining, more traditional propane or electric cooking appliances are likely to be more useful. 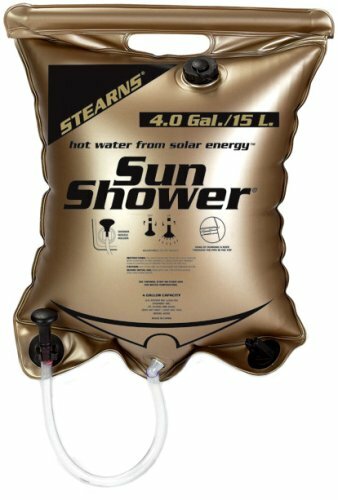 Bag-type solar showers pack small and light, and they work OK for backpacking or camping trips, but the gravity flow design usually makes for a lousy shower for regular use. For a serious off-grid solar shower, check out the NEMO Helio Portable Pressure Shower, which packs small, and uses a foot pump to give you 5-7 minutes of high pressure hot water. 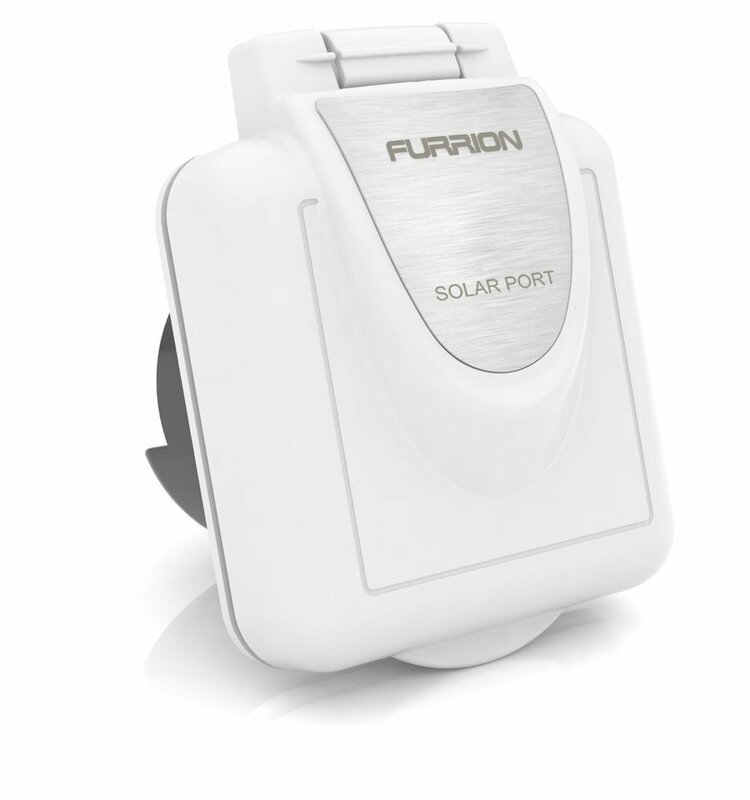 If you don't have electricity in your home, but you need to charge your cell phone, a small solar USB charger might help. 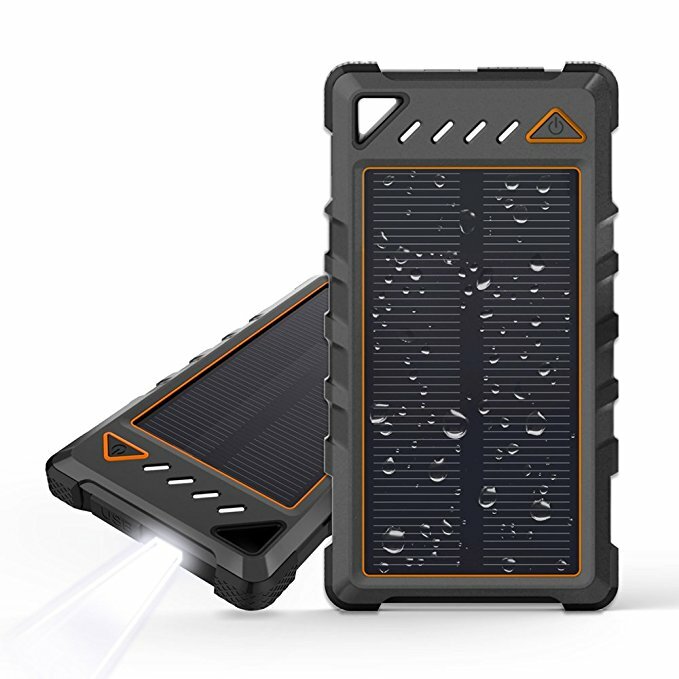 A portable USB solar charger with a built-in battery like the Beartwo Portable Solar Charger can be helpful for occasional or emergency backup use. But for use as a primary phone or tablet charger, you'll want a larger panel system like this 24 watt RAVPower solar charger with an optional external battery to store excess power. Portable "suitcase" style solar panel systems work well as a ground deploy to charge a small battery bank. 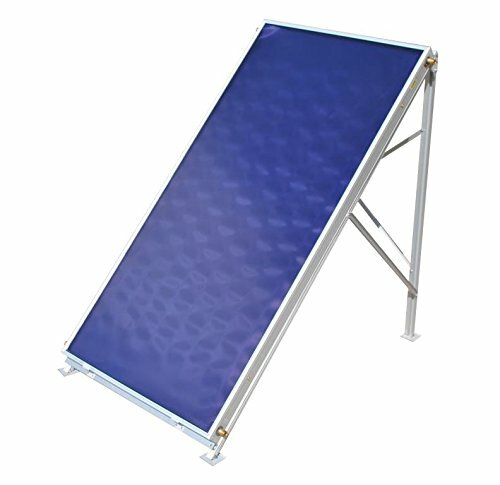 A ground deploy typically requires very little installation work, and the panel can be placed in the sun, even if your home is parked in the shade. 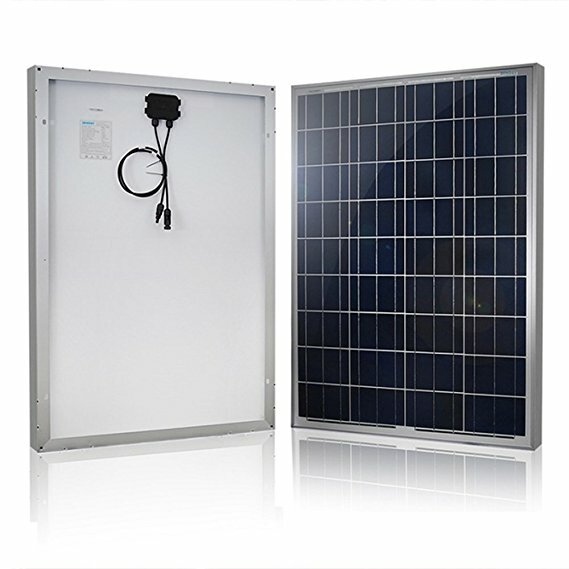 A system like the Renogy 100 Watt Solar Suitcase with Charge Controller can be wired directly to a battery, or through an RV solar receptacle. If you have an on-board solar charge controller, you can wire your RV solar receptacle to your charge controller, and use a suitcase without a charge controller instead. 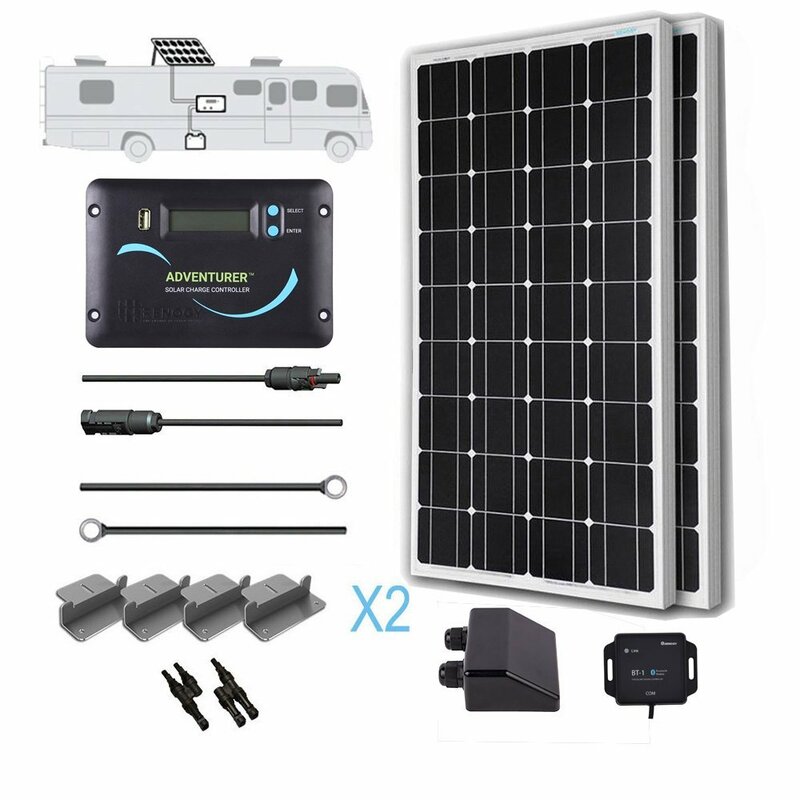 AM Solar's RV Solar Education - geared toward RV systems, but relevant for general system design, especially when using a 12v system. Handy Bob's Blog - a.k.a. "Angry Bob," a very opinionated take on off-grid solar. I wouldn't take everything he says as gospel, but this is a guy who knows his stuff, and the entire blog is worth a read. The Fit RV's How Much Solar Do I Need - also an analysis geared toward RVs, but a fantastic primer regardless of your application. Technomadia's Lithium Page - lots of personal experience with a large RV lithium battery bank, and good information about installing your own. Off-Grid Solar Calculator - get a rough estimate of how much solar you need to keep up with your loads. Sun Surveyor App - great for planning a stationary solar install. Uses your camera to give you a live picture of the sun's path in any season, so you can see where the obstructions are. Bestconverter.com - has some of the lowest prices I found for some of the supplies listed in this article. If you're price shopping, this is a good place to check. I spoke with the owner, Randy, on the phone when I needed to exchange my SeeLevel tank gauges for the shorter model, and he was responsive and friendly. West Marine - carries a lot of the miscellaneous hardware you'll need to wire up your DC electrical system. Switches, bus bars, fuse blocks, lugs, etc can all be found here. Marine components are generally higher quality than those made for RVs, so a marine supply store is a good place to look for what you need. Do you have a favorite solar power resource we didn't mention? Drop us a link in the comments.